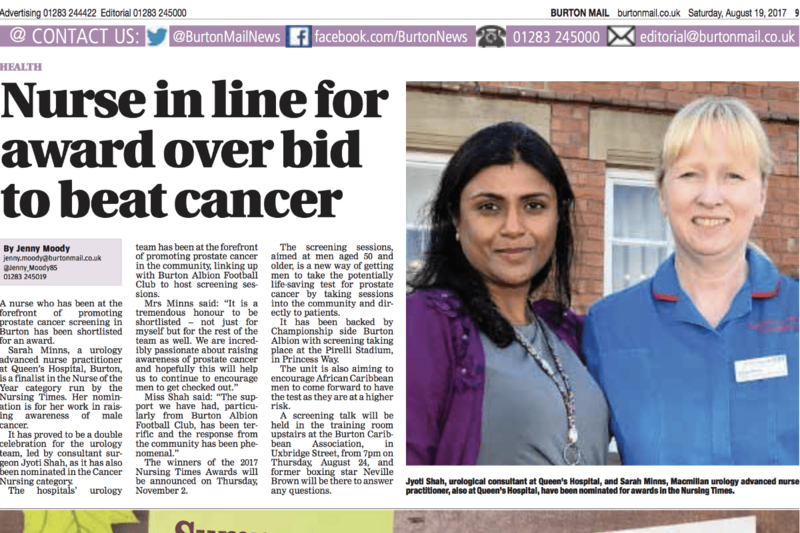 Surgeon takes prostate cancer screening to the community. 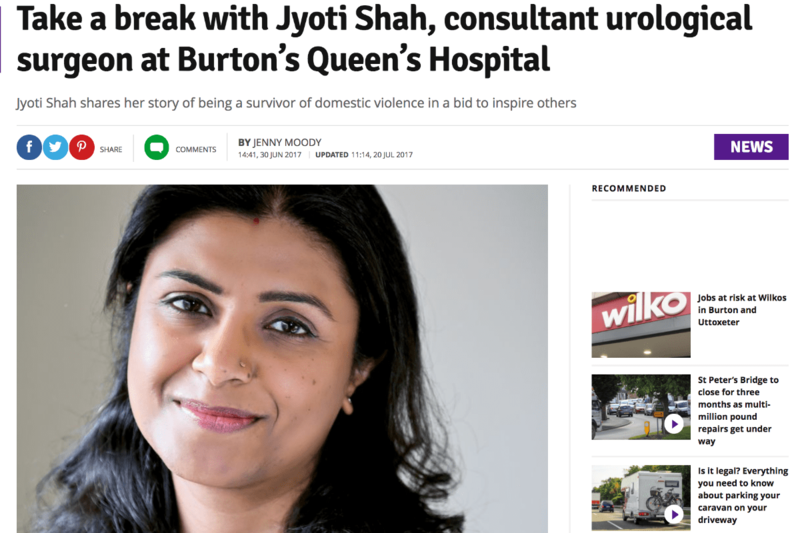 Surgeon Jyoti Shah won’t let men die of embarrassment. 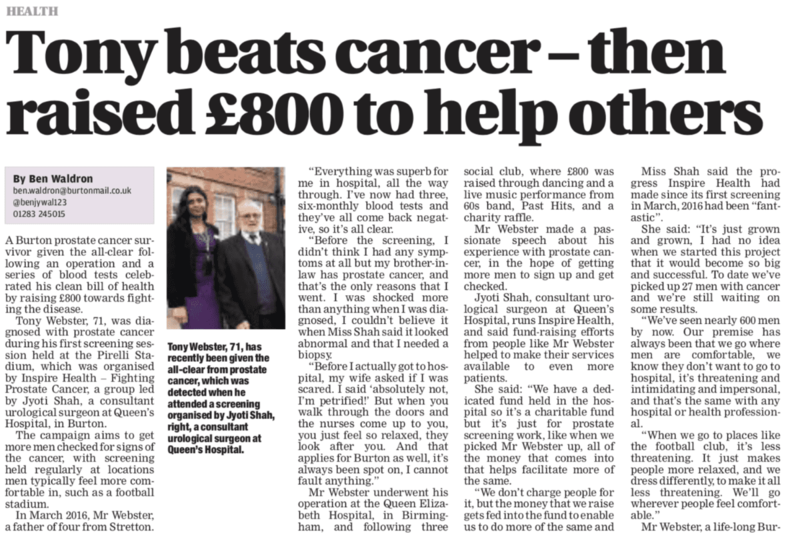 Instead of waiting for patients to come to her, she goes out and gets them. 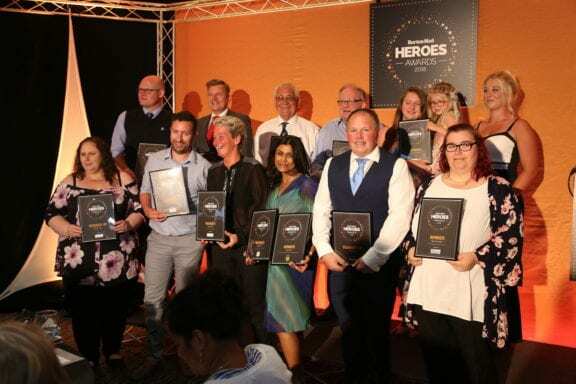 Meet our heroes as part of the glamourous awards ceremony at Burton Albion to celebrate success in the community organised by Burton Mail. 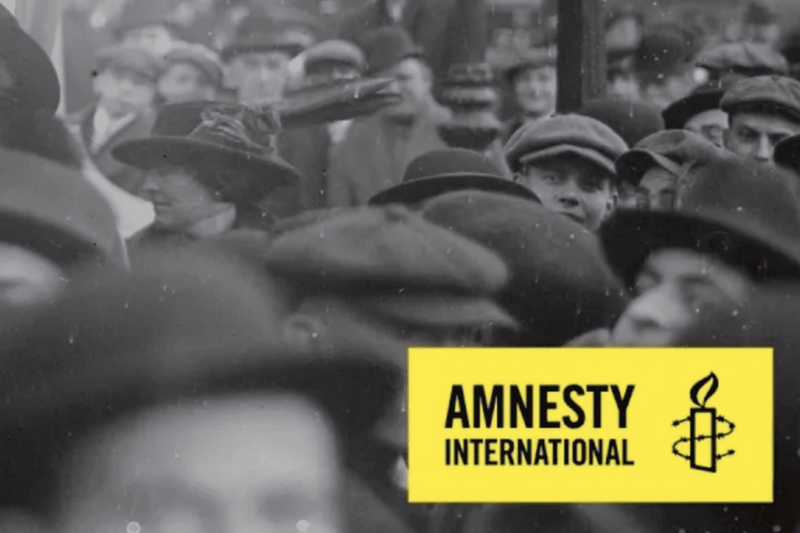 Amnesty International awards Indian origin surgeon in the UK. 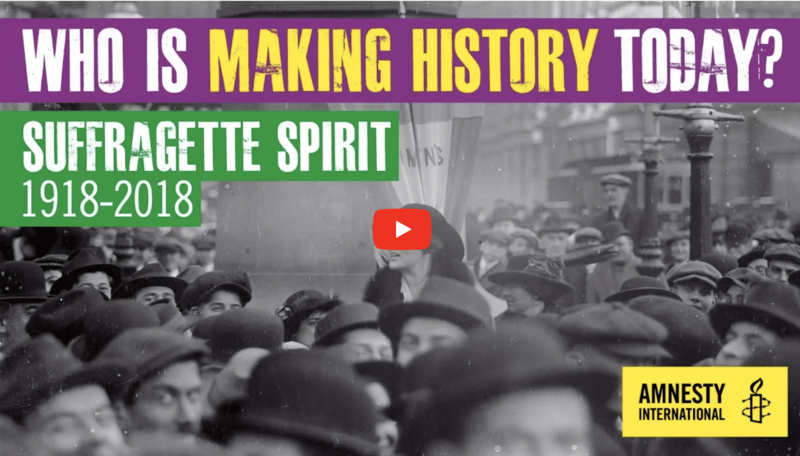 This month marks 100 years since the suffragettes fought tooth and nail to secure change for women …. 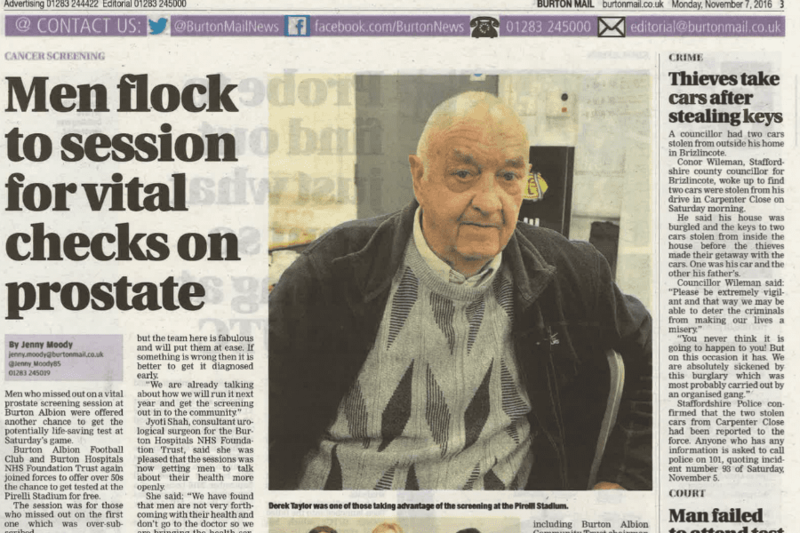 More men are dying from prostate cancer than women from breast cancer for the first time in the UK, it has emerged. 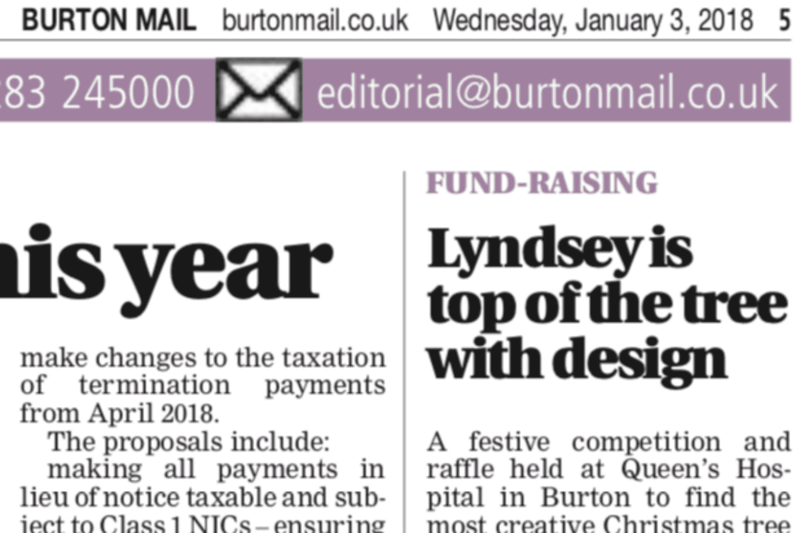 A festive competition and raffle held at Queen’s Hospital in Burton to find the most creative Christmas tree design raised much-needed funds to fight the most common male cancer. 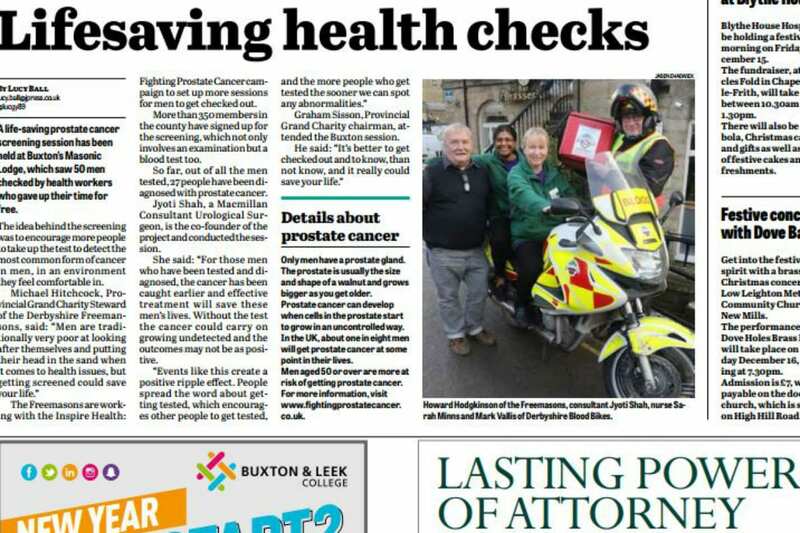 Freemasons from across Derbyshire were at the Pirelli Stadium yesterday to receive free checks for prostate cancer. 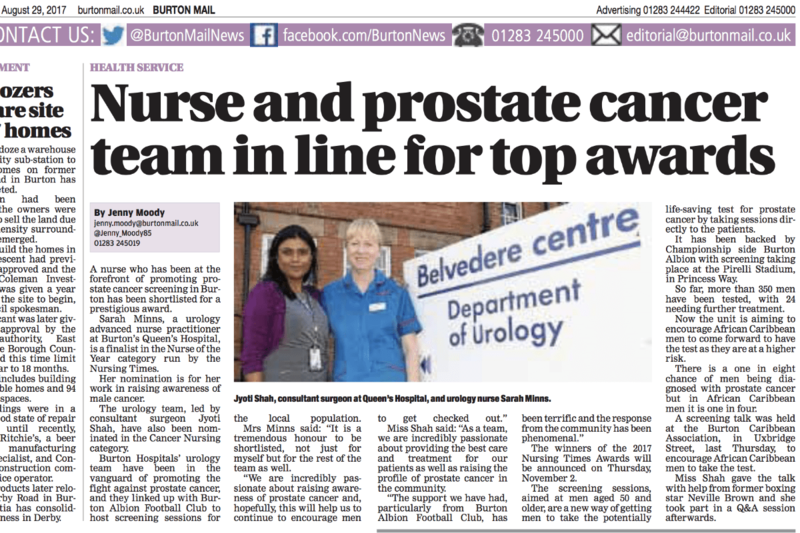 Nurse and prostate cancer team in line for top awards. 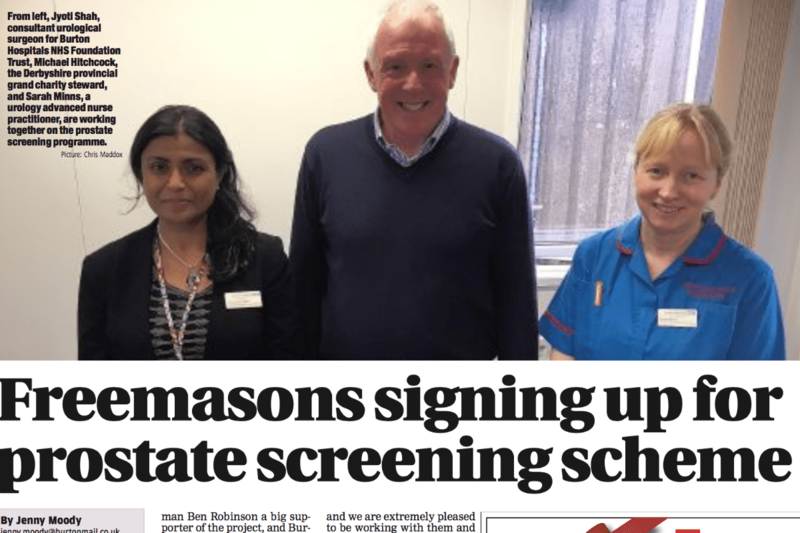 A nurse who has been in the forefront of promoting prostate cancer screening in Burton has been shortlisted for an award. 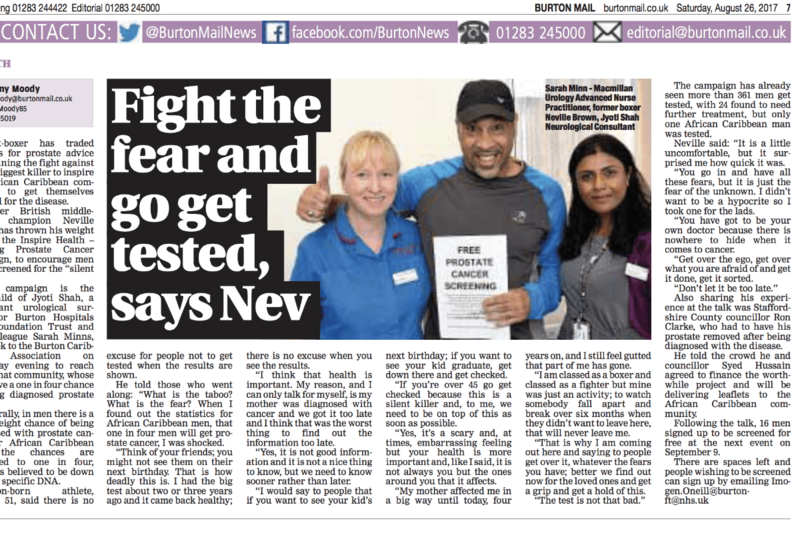 An ex-boxer has traded punches for prostate advice after joining the fight against men’s biggest killer to inspire the African Caribbean community to get themselves checked for the disease. 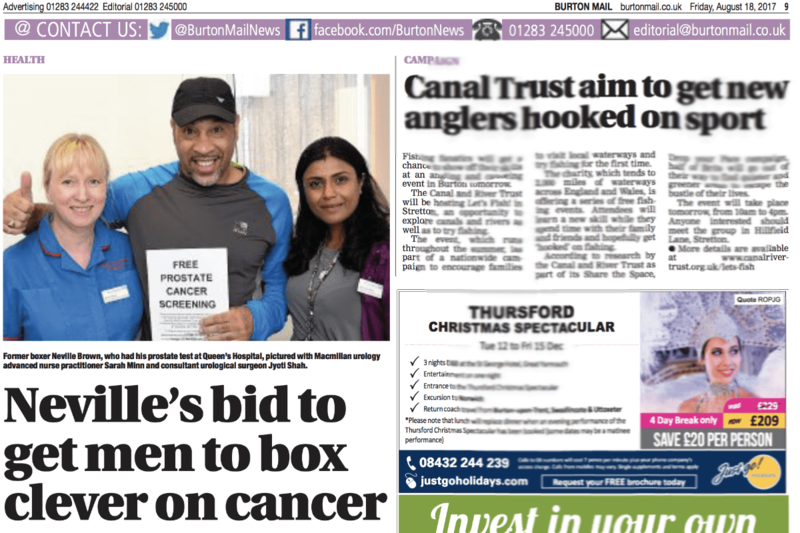 A former professional boxer is hoping that men will join the fight against cancer – by taking advantage of prostate screening in Burton. 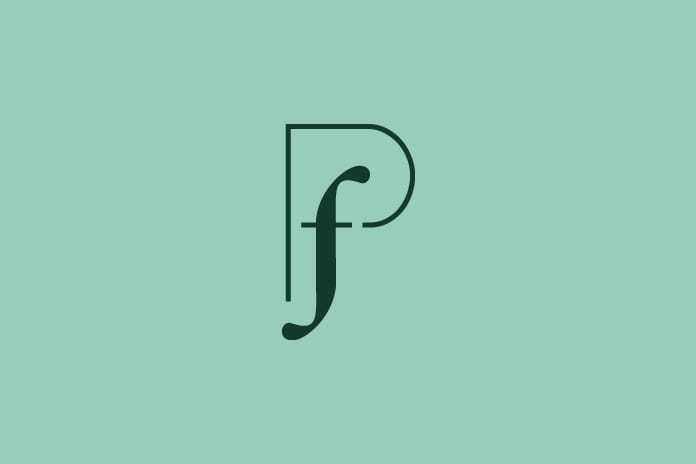 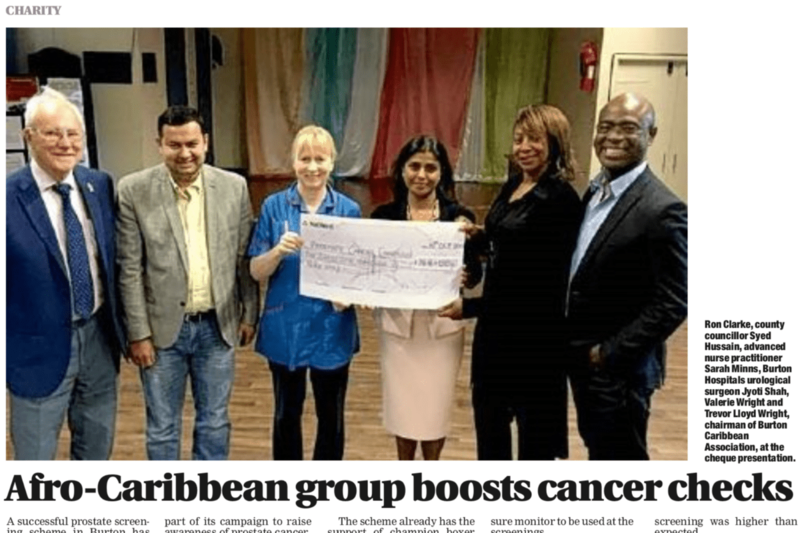 Prostate Cancer is the commonest cancer in men and African Caribbean men are twice as likely than men in the general population. 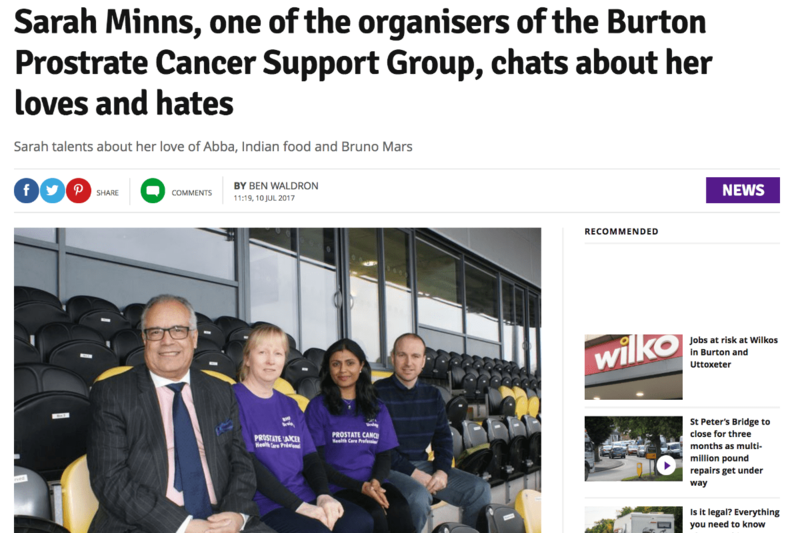 After the success of Burton Albion screenings, this screening is particularly aimed at the African Caribbean community. 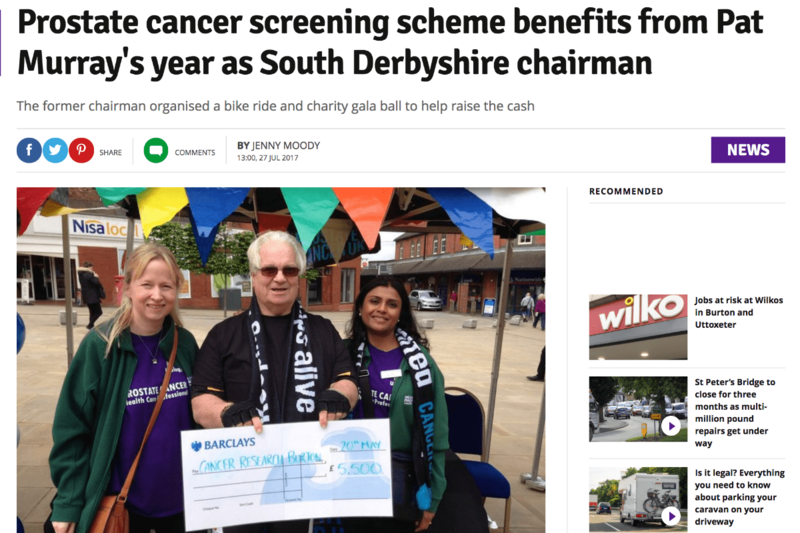 A screening scheme which encourages men to get their prostates checked has benefited from more than £5,500 after a council’s departing chairman got on his bike to spread the word. 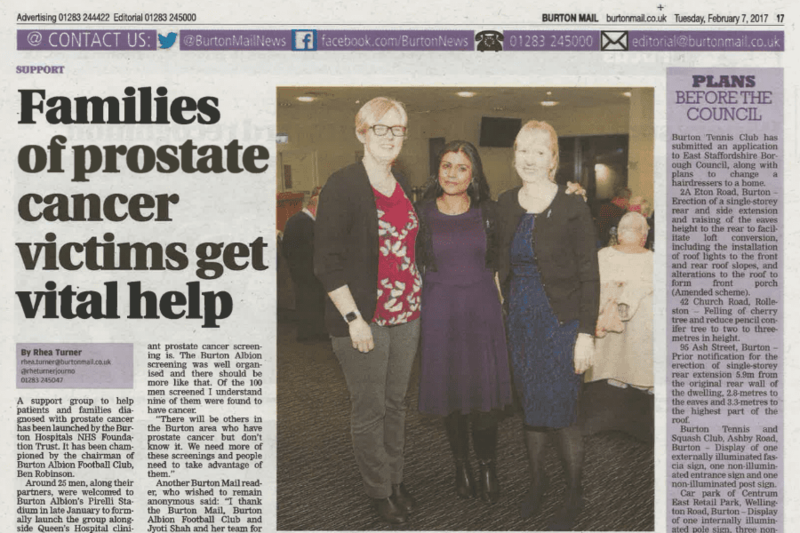 Sarah Minns is part of the Burton Hospitals Trust team, along with Jyoti Shah, who has joined forces with the Burton Prostrate Cancer Support Group to bring support to those suffering with the condition in and around the Burton area. 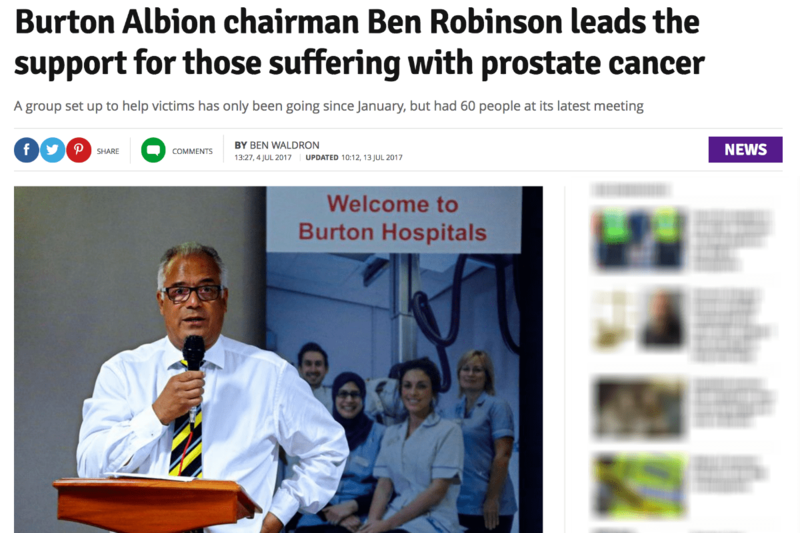 Burton Albion chairman Ben Robinson leads the support for those suffering with prostate cancer. 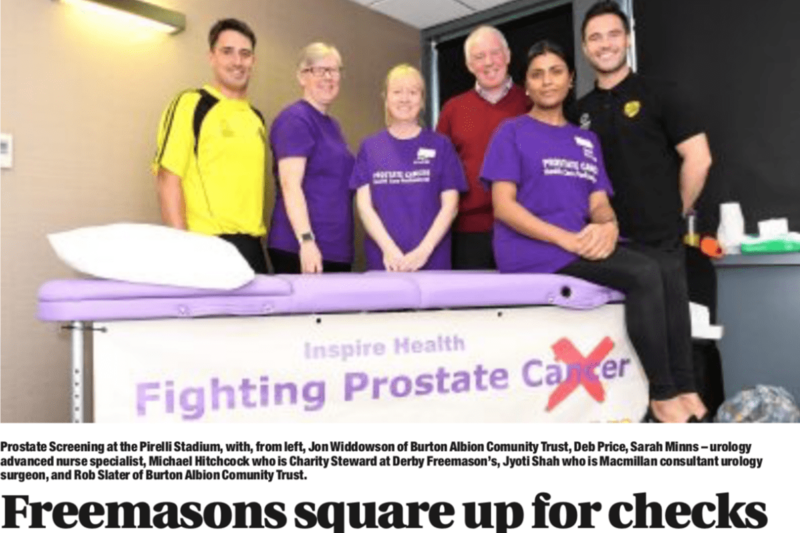 Burton Albion chairman Ben Robinson has given his backing to helping men fighting prostate cancer. 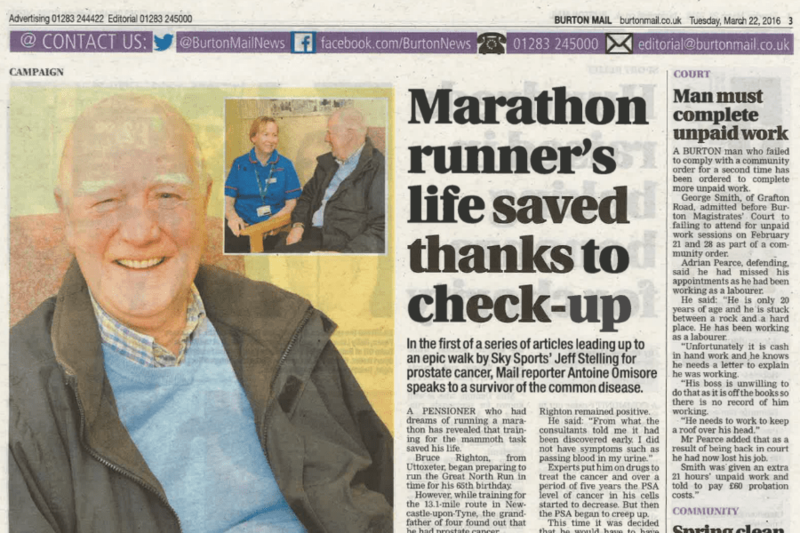 He made a guest speech at the monthly meeting held at Burton’s Queen Hospital which supports those affected by the cancer. 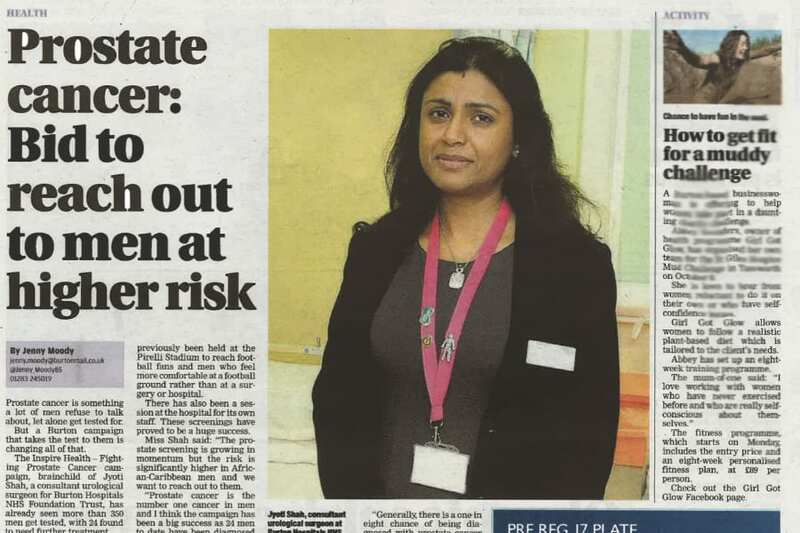 Jyoti Shah, a consultant urological surgeon at Burton’s Queen’s Hospital, has got men talking about their health by going out into the community with her prostate screening programme. 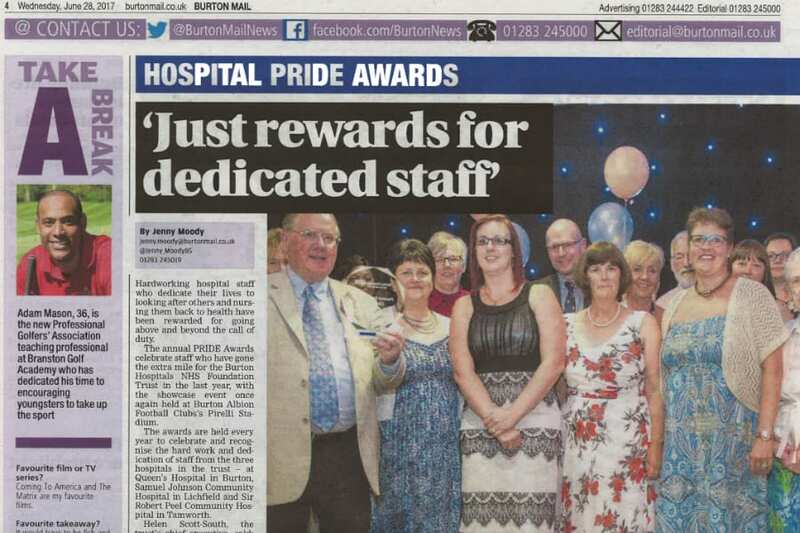 Pride Awards: Just rewards for dedicated staff. 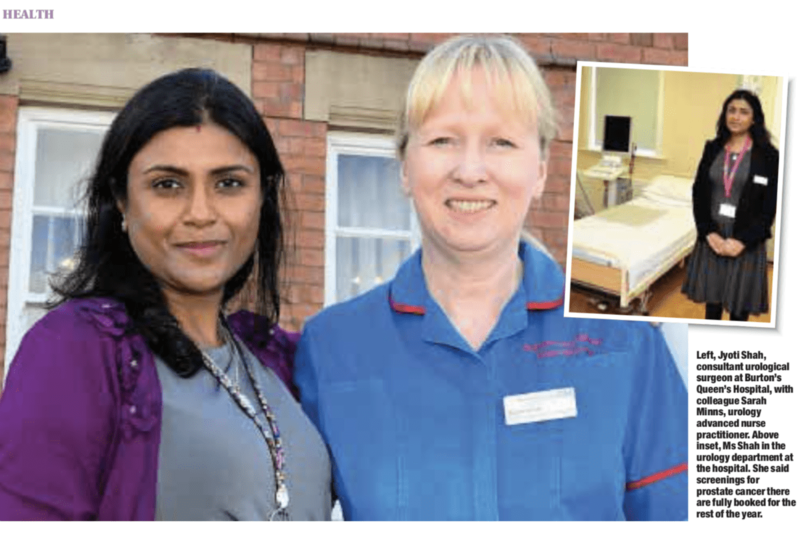 Hard working staff who dedicate their lives to looking after others and nursing them back to health have been rewarded for going above and beyond the call of duty. 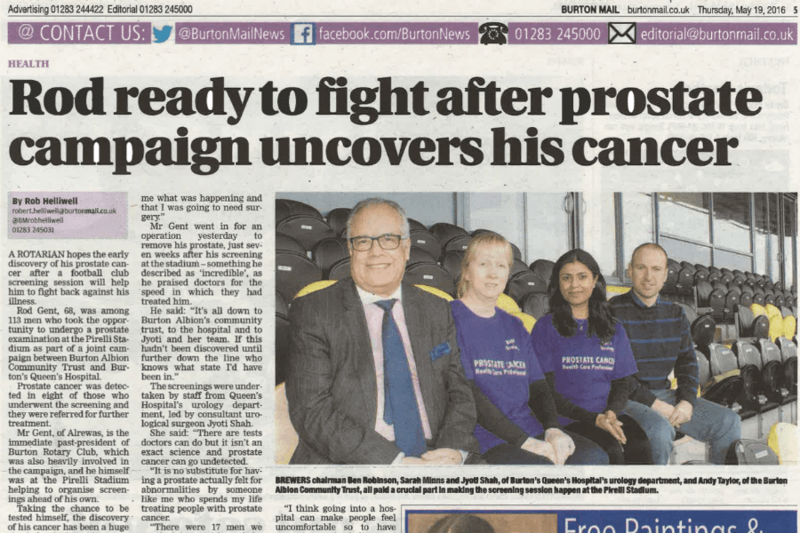 A successful campaign which helped diagnose eight men with prostate cancer is returning to Burton in a hope of saving more lives. 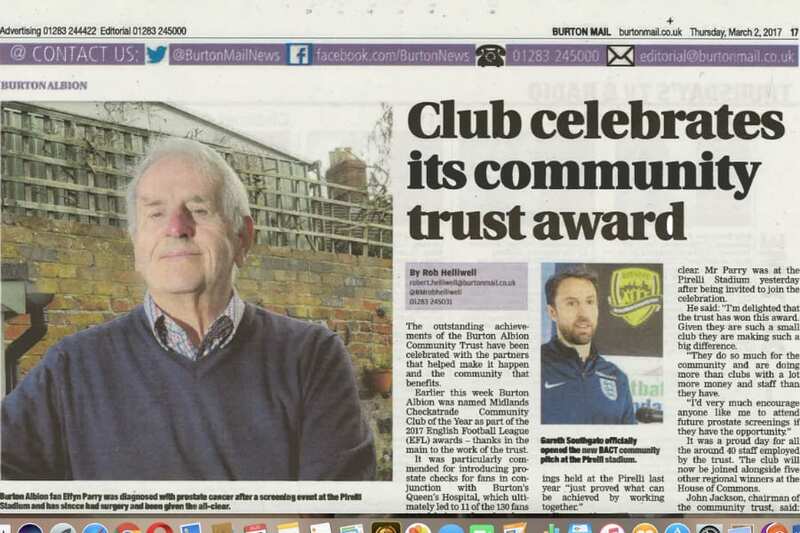 The outstanding achievements of Burton Albion Community Trust have been celebrated with the partners that helped make it happen and the community that benefits. 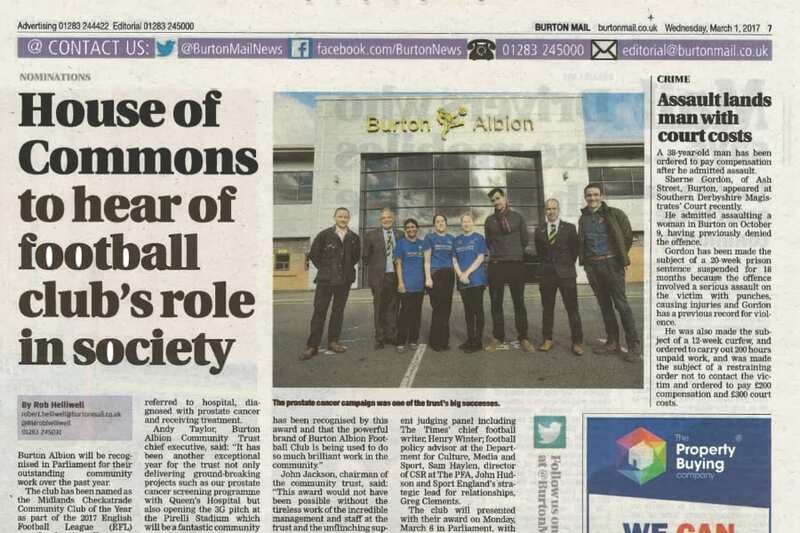 Burton Albion will be recogised in Parliament for their outstanding community work over the past year. 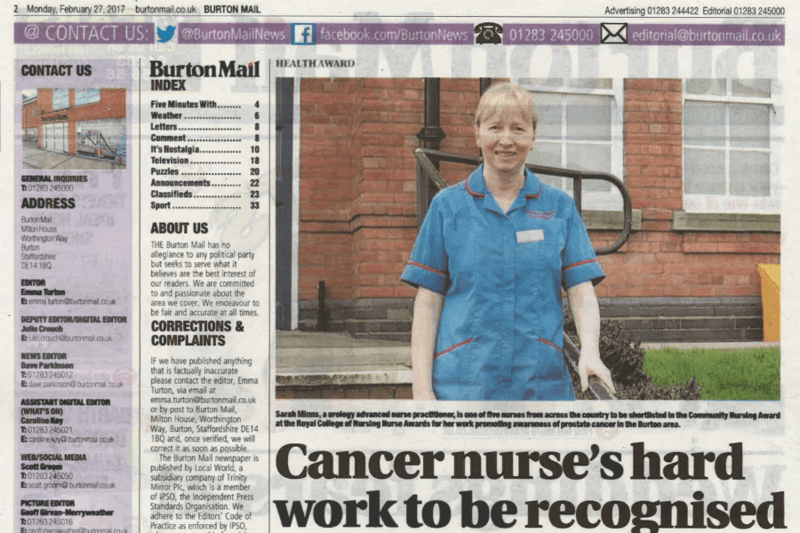 A nurse who made a name for herself by promoting the importance of prostate cancer awareness is up for a prestigious national award. 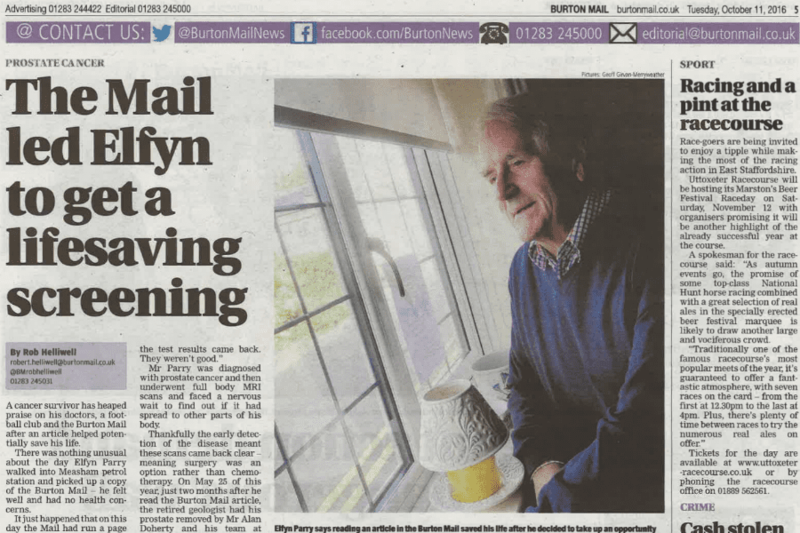 A BBC team came to record the screening on 5th November 2016 which was subsequently broadcast on 14 November 2016. 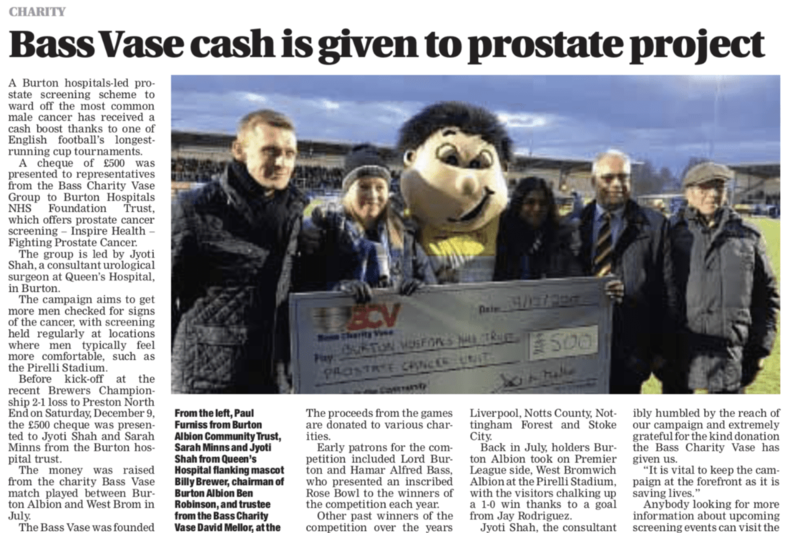 Men who missed out on vital prostate screening at Burton Albion were offered another chance to get the potentially life-saving test. 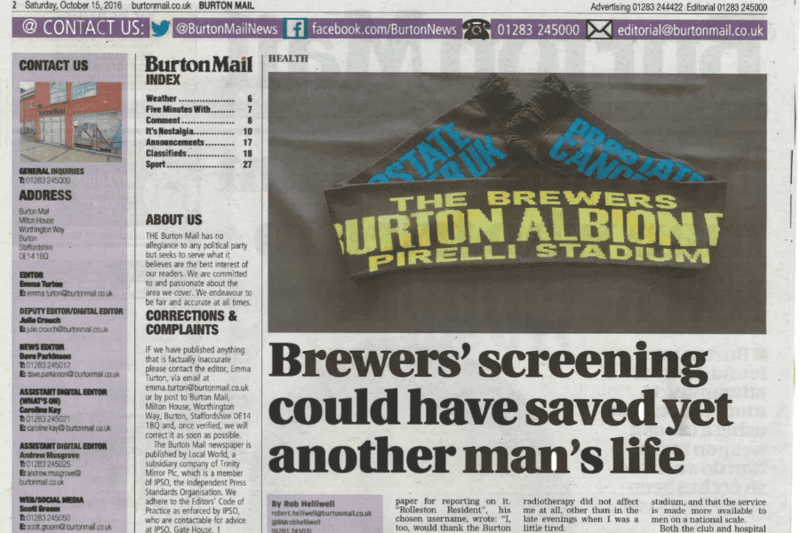 It appears that yet another life could be saved thanks to a pioneering cancer screening event at Burton Albion Football Club. 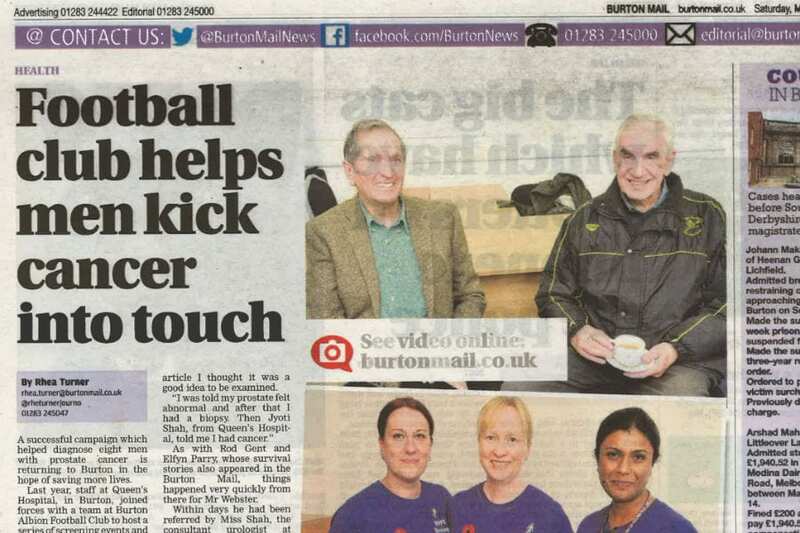 A week of coverage by Burton Mail on the prostate cancer. 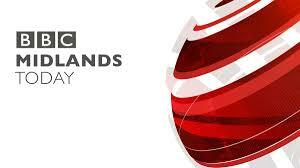 BBC Midlands Today report on the prostate screening. 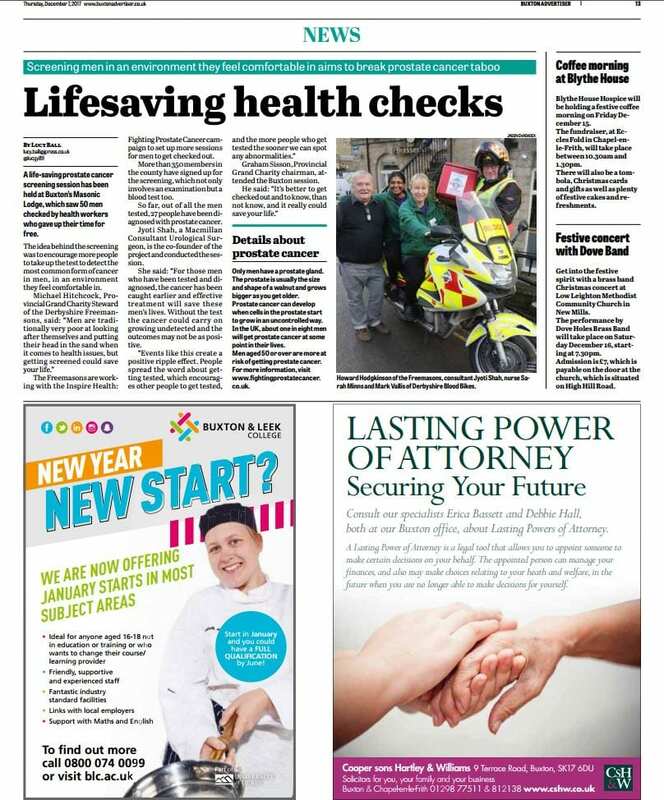 A cancer survivor has heaped praise on his doctors, a football club and the Burton Mail after an article helped potentially to save his life.